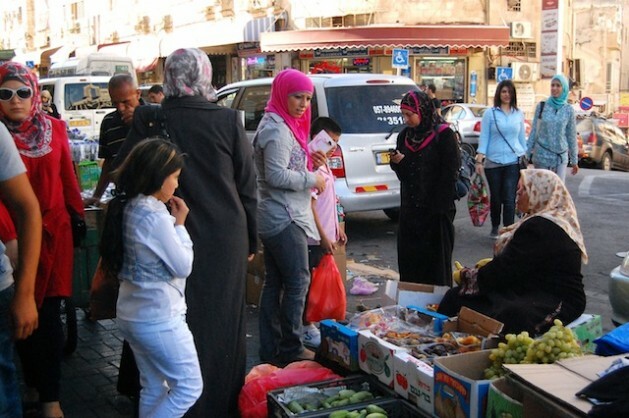 Many Palestinian women face high levels of domestic violence. Credit: Jillian Kestler-D'Amours/IPS. RAMALLAH, Occupied West Bank, Aug 16 2012 (IPS) - After the brutal murder of a Palestinian woman in late July in a busy Bethlehem marketplace, local human rights groups are pushing for stronger reforms to stem violence against women in the West Bank and Gaza Strip. Nancy Zaboun, a 27-year-old mother of three, was violently killed by her husband on Jul. 30 in Bethlehem. The murder took place after Zaboun left a divorce hearing. Her husband had reportedly beaten her regularly over the course of their ten-year marriage. On Jul. 18, the body of another woman was taken to Shifa hospital in Gaza City. Palestinian police have reportedly arrested two of the woman’s relatives in connection with the killing, which is suspected to have been carried out to preserve “family honour”. In 2010, the Independent Commission for Human Rights documented the cases of nine women who had been killed for this same reason – to preserve “family honour” – in the occupied Palestinian territories. In addition to these “honour killings,” a 2009 study published by the Gaza-based Palestinian Women’s Information and Media Centre found that 67 percent of Palestinian women reported being subjected to verbal violence on a regular basis, 71 percent to psychological violence, 52.4 percent to physical violence and 14.5 percent to sexual violence. In January 2011, the Palestinian Authority (PA) passed a National Strategy to Combat Violence against Women for the period 2011-2019. The programme aims to create work training and empowerment programmes for women, provide social support, and promote a legal framework to stem violence. Article 340 granted a man exemption from prosecution and reduced penalties for killing his wife or other female relative if she is caught committing adultery. Article 18 provided leniency for the same crime if a man can prove that he acted in order to preserve his honour or the honour of others. Articles 97, 98, 99, and 100 of the Jordanian penal code deal with mitigating circumstances can be used to justify “honour killings,” – Article 98 allows perpetrators to avoid punishment if they can prove that they acted in a “state of rage”. “The existing law still allows for women to be killed, still allows for impunity,” said Tahseen Elayyan, head of the ‘Protection of women in armed conflicts’ project at the Ramallah-based Al Haq human rights organisation. “In order to take practical steps towards protecting women, especially from the so-called honour killing, the law must be changed, and perpetrators of this type of killing must be held accountable,” Elayyan told IPS. This is especially true in the Gaza Strip, where the increasingly harsh economic and social conditions created by the Israeli siege have translated into violence against women, according to Mona Shawa, head of the women’s unit at the Palestinian Centre for Human Rights (PCHR) in Gaza City. We desperately need to get to the roots of why women the world over are used as scapegoats and perceived as inanimate objects. These perceptions and behaviours are learned. We do not enter this world hating our mothers, grandmothers, sisters, aunts, and beloved daughters. Honour is not found between a woman’s legs. Virgins and small children at that are not a cure for sexually transmitted diseases. If a woman does not want you in marriage or in bed, that is the way it is. Feel your sorrow and leave it at that. If you only feel anger then run away and keep running till all your anger is left on the earth behind you. You are not entitled to any woman, anywhere, anytime, or any way …ever. Question all that you have been taught and never stop doing this. Do this and you will eventually hear your heart speaking, peace will come to live in your being, the stars will shine through your eyes, and … we will all fall in love with you.